Your choice of contractor has the potential to make or break your project. Make sure you choose an experienced contractor like Cabinet Magic for your Kitchen remodeling in Glendora CA. At Cabinet Magic, we have over 30 years of experience in cabinet fabrication and remodeling. We know exactly how to get you the high quality products you need and manage all the moving pieces of the project so that the work gets done on time, on budget, and with superior quality craftsmanship. When you’re just changing one aspect of your kitchen, such as your countertop or your flooring, it’s not too difficult to imagine the finished result. 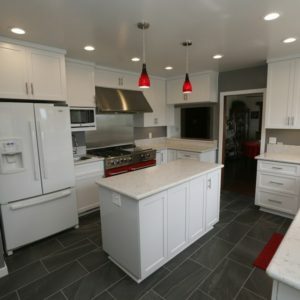 However, the more complex your kitchen remodeling in Glendora CA is and the more aspects of the kitchen you change, the harder it is to really visualize what you’re getting yourself into. Many people have found that a color that looked amazing in a sample size was too dark, too bold, or even too bland once their new flooring, cabinetry, or countertops were installed. At Cabinet Magic as your contractor, you’ll never get left in suspense regarding how your kitchen remodeling in Glendora CA will turn out. We know you want to feel confident of what you’re getting before you entrust us with the project. That’s why we offer 3D computer rendering services on every remodeling project. We’re happy to create multiple versions of the design so you can easily compare different options. We never begin work without your sign off and approval of every detail of the design. Custom cabinetry can take your kitchen remodel to a whole new level. You’ll be able to maximize your storage space while also incorporating the features you want and the style you need to integrate seamlessly with your overall interior design. At Cabinet Magic, we have almost 30 years of experience in crafting custom cabinetry. We can custom fabricate any size cabinets with any combination of doors, drawers, roll outs, racks, and other storage accessories, and of course you will have your choice of styles and finishes. We take pride in our exceptional craftsmanship and we are confident our cabinets will last for decades. Take the first step towards beginning your kitchen remodeling in Glendora CA today by contacting Cabinet Magic at 800-828-4380 and requesting your free in home consultation. We can help you price the upgrades you want and give you a free estimate.